Where the Seagulls Meet the Parrots…. I can think of a few places where this occurs. One of my most-loved destinations is Cook Park, which extends quite a way beside a number of beaches in Sydney. This shot was taken near Ramsgate Beach. 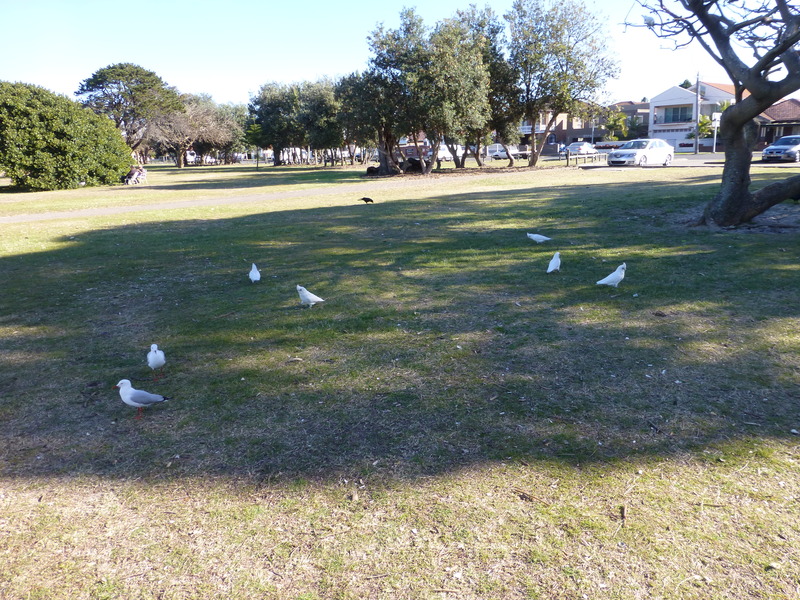 It’s quite commonplace here to witness seagulls mingling among the Corellas and Cockatoos. Throw in some Ibis and Willie Wagtails and there you have it: bird-watchers’ delight…. What a glorious day we’ve just experienced! Sunshine, caressing breezes, and perfect midday temperatures made Sydney, Australia, a wonderful place to explore. With a maximum of twenty-two degrees Celsius at about two p.m., ditching our winter woolies was no problem. Hardly souls braved the breakers, with beaches recording (almost) enjoyable water temperatures. Those whose tastes don’t run to the beaches could enjoy other treats. Magnificent magnolias are in full bloom now, with gorgeous wine-pink blooms atop bare branches. The recent rains have greened the gardens, so many are fresh and inviting. And to think: the official start to Spring is a mere four weeks away! At the Beach : My First Encounter…. Sydney-siders like us woke up to a wonderful day, full of blue skies and the promise of unseasonal, warm weather. We weren’t in for a disappointment, either, since by mid-morning one could be forgiven for thinking it was summer. The lure of the sea-side overwhelmed me, so off we set, with a hastily-packed lunch, my swimming gear, and our little dog: off to the beach for a few hours of sunshine and activity. In case you’re wondering, the water temperature wasn’t too bad, and more than just me ventured in for a dip. I loved to see the shells in all their shapes and sizes as I walked into the baths, and more: their underwater beauty shone through, if you took the time to notice. We’d just finished lunch, and my eyes were trained on the ocean. Suddenly, I spotted it: a black flash, a fin! And that’s precisely what it was: a dolphin, surfacing and diving! My first dolphin! But I was wrong. It wasn’t A dolphin: it was two! So, we watched transfixed as the pair of them swam away, seemingly immersed in their game of follow the leader. A perfect end to a wonderful day!